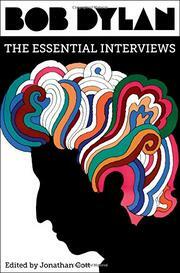 A dense compendium of significant feature interviews with Bob Dylan. Rolling Stone contributing editor Cott (There's a Mystery There: The Primal Vision of Maurice Sendak, 2017, etc. ), who contributes two interviews, discusses Dylan’s intimidating nature as a subject given his reputation for fungible autobiography: “His life story changed as he proceeded onward in his journey….You would also never know what his voice was going to sound like.” These 34 interviews illustrate how Dylan’s role in society changed over time, following his days as a precocious folk singer (the earliest interview dates from 1962). Some well-known interlocutors appear, ranging from Studs Terkel and Nat Hentoff to Sam Shepard and Jonathan Lethem, who characterizes Dylan in 2006 as “not impatient, but keenly alive to the moment, and ready on a dime to make me laugh and to laugh himself.” Despite Dylan’s reputation for “dislik[ing] interviews for years because he’s always asked to reveal something about his personal life or to interpret his lyrics,” he generally comes across as cheerful and generous, if mischievously opaque. The earlier interviews show him grappling with fame and influence against the chaotic backdrop of the 1960s. Regarding his departure from political songwriting, he observed in 1965, “you can make all sorts of protest songs and put them on a Folkways record. But who hears them?” In the 1970s, interviewers tracked his strange side projects, such as the four-hour film Renaldo and Clara, which coincided with his painful divorce, and his controversial excursions into born-again Christianity. By the 1980s, interviews showcased Dylan as a resurgent elder statesman of rock, a recurring motif throughout the last interview here, Douglas Brinkley’s long 2009 feature in Rolling Stone, in which Brinkley writes, “everyone feels energized by his charismatic presence.” The overall effect is an immersion in a singular figure’s life, though a fuller chronology of Dylan’s recordings and accomplishments might have provided accessibility for neophytes. An engaging archive of Dylan’s own perspective on his artistic process and ever changing cultural significance.